As many of us relaxed a little and enjoyed the summer holidays, Melbourne Law School students were busy working as interns in fascinating and emerging areas of the law. Reflecting interest in the issues that resonate with their generation, this year's students took on internships in environmental law, animal rights law, communications law, media law, native title law, human rights law and sports law. For some students this meant they learnt the legal workings of the AFL draft first hand. Others joined the legal team supporting the Victorian Bushfires Royal Commission. Students pursued their interest in environmental law by grappling with the legal issues of climate change, the health of the environment at the Australian Conservation Foundation (ACF), and the legalities of greenhouse emissions at Linfox. Some got a taste of the complexities and changes in media and communications law with internships at Fairfax and Telstra. Those interested in careers in government joined the legal team at the Department of Prime Minister and Cabinet, while a significant number of students explored the growing interaction between lawyers and activists in lobbying and issues-based groups. Students joined bodies such as the Consumer Action Law Centre, Stop the Traffik – a group working to prevent people trafficking – and Voiceless, the animal protection institute. Considering the attraction of young people to new and emerging areas of the law, General Counsel at the ACF, Julian Chenoweth understands the appeal, "With such a strong focus on policy issues around water resources and climate change, students are keen to gain experience on delivering the best environmental outcomes." Also, Mr Chenoweth has found that from a practical point of view, participation in the Law School's internship program has increased the effectiveness of ACF's advocacy work, by adding valuable research capacity. "Interns bring insight from their studies and other work experience, giving a high level of expertise in areas directly relevant to our work," said Mr Chenoweth. For student Joanne Tassone, her internship at animal rights group, voiceless, gave her fantastic, yet unexpected experiences. "I was lucky enough to join Katrina Sharman, Voiceless' corporate counsel, discussing the organisation's Animal Law Toolkit on Bush Telegraph, for ABC's Radio National. The experience showed me how important it is for lawyers to be able to communicate with a broad range of audiences." As one of the growing number of lawyers and students interested in animal rights law, Joanne found her time at Voiceless provided invaluable insight into the role lawyers play in advocacy and lobbying – as well as what is involved in doing a media interview. 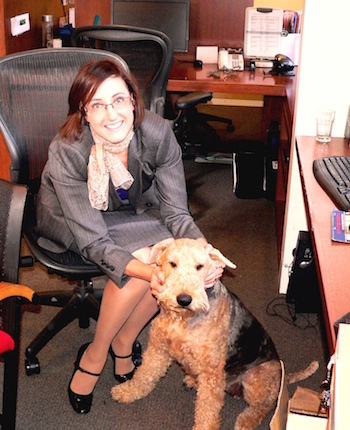 "It is a very interesting time to be involved in animal law. It is an area of law developing rapidly as awareness of these issues grows", said Joanne. While the experience of being an intern provided Joanne with a raft of valuable experiences, the benefits flowed both ways. Corporate counsel for Voiceless, Katrina Sharman found the experience of hosting an intern an extremely positive one. "Joanne made a wonderful addition to the Voiceless team and an invaluable contribution to our work. It was a pleasure to have such a talented and passionate law student with us. We look forward to remaining involved in the Law School's internship program," said Ms Sharman. In recent years, animal rights law has attracted significant attention as policy makers contemplate the treatment of farm, working and domestic animals. Melbourne Law School is one of only six law schools in Australia teaching in this emerging area.